Bradley & Faulkner, PC, is Southwestern New Hampshire’s largest law firm and offers over 150 years of combined legal experience in virtually all areas of civil practice. Our law firm is located in Keene, the county seat of Cheshire County. Bradley & Faulkner, PC is a full service law firm serving southwestern New Hampshire. 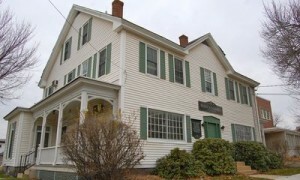 The firm consists of four lawyers and is based out of 50 Washington Street, Keene, New Hampshire. In 1907, Philip H. Faulkner opened his law office upstairs in the Sentinel Building on Main Street in downtown Keene, creating what became the Faulkner, Freund, Worthen & Caffrey law firm. In 1943, Homer S. Bradley, Sr., passed the New Hampshire bar exam and joined the Faulkner firm. Homer did not have the benefit of a law school education in his quest to become a lawyer, but instead “read the law” with the assistance of his mentor, Philip H. Faulkner. This was a common practice at the time. Homer Bradley set out on his own to found the Bradley law firm in January of 1947. Homer’s son, Sam, joined the Bradley firm in 1959. Under the younger Bradley’s leadership and dedication the firm continued to thrive.